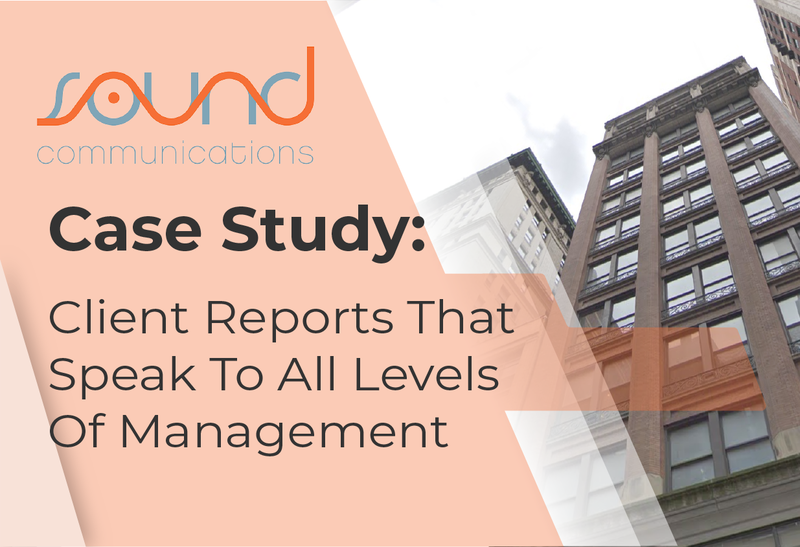 Sound Communication Case Study: Client Reports That Speak To Every Level Of Management. A.J Jordan, the VP of Digital Media and Richard Maimone, Digital Marketing Strategist came across NinjaCat on a cold call from one of our sales ninja’s. Right off the bat you could tell that Sound Communication was different. They had been around since the 1980’s, adaption to change is why they are a leader. They are a full service media buying agency in midtown Manhattan who employs 20-25+ people, and has a large swath of clients who purchase media in TV, Radio, Social Media, Digital Streaming and more. After talking with our strategy development ninja’s they saw an opportunity to sharpen their competitive edge, reduce overhead costs and raise the quality of their client reporting functions. Sound Communications knew the reports they produce were being handed down the line, 3 maybe 4 or 5 different people. Some, might even be far removed from the analyst. They needed reports that could speak to all, make everyone look like a rock start to their bosses and would not be misinterpreted as it was handed up or down the ladder. Sound Communications knew competitors would be thinking the same and searching for a game changing, easy to roll out, reporting solution that offered dashboards. In order to continue on for the next 30+ years, this reporting solution needed to be a robust, informative reporting platform and needed to help analysts move away from screen shots and power points. Sound Communications needed professional presentations that would be functional to various different management levels, all who were tracking their own set of KPIs. They had very specific needs when it came to building a reporting solution. They needed the ability to go granular but also create executive level reports and summaries. Sound Communications also wanted succinct, easy to read reporting that is easy to pass off to client services or other clients. And anyone who gets this report can’t misinterpret the data. We need it to clearly state the story of our marketing. It has to be automated and scale with us as we grow and as new integrations are needed. It had to be able to connect the Client Services team to the Analytics team and needed to also pass muster with management. Above all, these reports needed to stun clients, managers and C-level leaders. No more reports, they wanted captivating client presentations. Sound Communications now has more time to sit down with clients and review the reports and add actionable insights from what the analytics team is showing in the data. This has allowed for stronger client relationships throughout the entire reporting chain. Client services can easily prove value with the new reports, they are able to deliver the data in different formats to suit the client's needs. The way the new reports are laid out, “clients have said they have a better understanding of the data”- Richard Maimone, Digital Marketing Strategist, and are now able to report on the metrics without a loss in fidelity. The new reports have strengthened the brand in the eyes of the clients and that makes Sound Communications look awesome! The analytics team is confident in the reports because of NinjaCat’s attention to data accuracy. There are tons of integrations available to Sound Communications with more coming out each month. Attribution, cross channel reporting and data mixing are now quick options you can automate. Management is excited because this has allowed them to keep that same edge that brought the company from its beginnings, to a digital power house today. The reports help with client retention and keeping employee headcount under control while still scaling and bringing on more clients and more reporting needs. A reporting platform that has the ability to go granular but also create executive level reports and summaries, anyone who gets the report can’t misinterpret the data. A platform that clearly states the story of their marketing, is automated and scalable, and connects the Clients Services team to Analytics Team, which also passes muster with management. Above all, these reports needed to stun clients, managers and C-level leaders. No more reports, they wanted captivating client presentations. 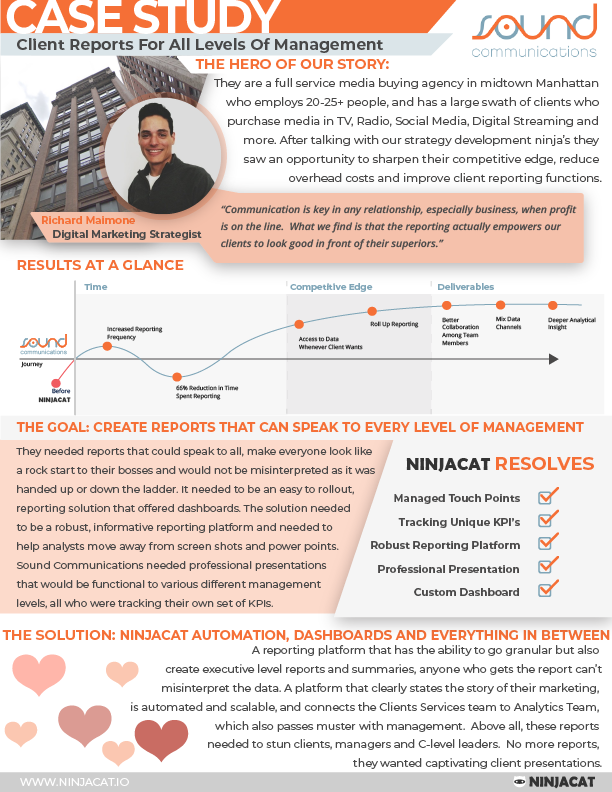 If you are looking to provide deeper insights with more data to your clients, sign up for our quick demo and see the potential of the NinjaCat reporting solution. Sound Communications knew the reports they produce were being handed down the line, 3 maybe 4 or 5 different people.